Healthcare professionals from across Ireland gathered at an event to mark the launch of a new partnership in the mobile technology sector. UK-based medical technology company Vanguard Healthcare Solutions and its Republic of Ireland and Northern Ireland distributor Accuscience hosted a joint event in Dublin earlier this month. Senior estates and clinical professionals from across the country met in the city’s Helix venue, part of the DCU Campus. Here they had the opportunity to hear from Steve Peak, Development and Delivery Director at Vanguard, on the different ways mobile healthcare solutions can impact on the heath service and its provision. They also had the opportunity to take a tour of the very latest mobile laminar flow theatre launched by Vanguard. This new unit provides a complete solution including anaesthesia and recovery rooms, scrub and utility areas as well as a fully-equipped operating theatre. 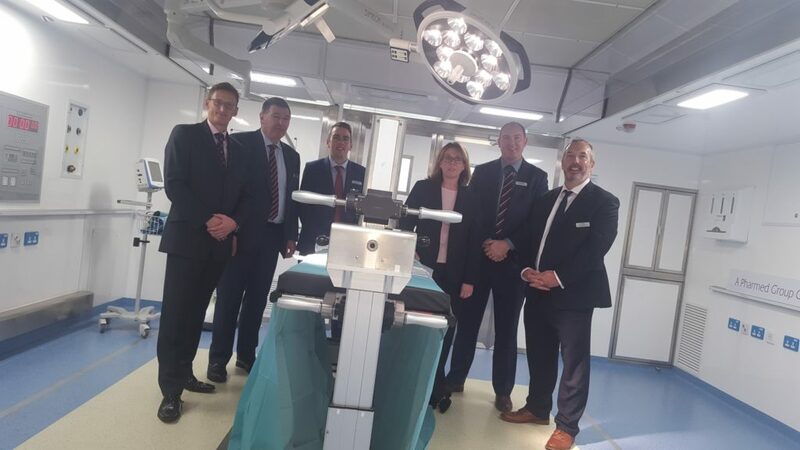 Alongside its temporary mobile clinical environments such as operating theatres, endoscopy suites, day surgery, clinics and ward space which help healthcare providers, including the NHS, increase patient capacity and clinical space, Gloucester-based Vanguard also provide highly trained support staff. Accuscience is based in Co. Kildare and took over management and distribution of Vanguard units and services in Ireland at the beginning of July. Complete solutions are available through Vanguard, including enabling works and connecting corridors, along with individual unit development and staffing. All of these is available in Ireland through Accuscience, a leading provider of specialist equipment, products, consumables and services. Vanguard Healthcare Solutions is a medical technology company which has partnered with healthcare providers in the UK and Europe for almost 20 years. We provide highly trained support staff and high quality temporary clinical environments such as operating theatres, endoscopy suites, day surgery, clinics, and ward space to help healthcare providers, including the NHS, increase patient capacity and clinical space. This can assist in reducing procedure waiting times. Vanguard mobile clinical units can increase clinical capacity in both planned and emergency situations. Since its foundation in 1982, Accuscience has been a leading provider of specialist equipment, products, consumables and services, consistently striving to offer best-in-class product to market coupled with dynamic commercial solutions to Public and Private Hospitals, Blood Transfusion Centres, Pharmaceutical Manufacturers and Academia throughout UK and Ireland. The Medical & Scientific Divisions are supported by a ‘Delivery to Bench’ Service with complete product life cycle cover including commissioning, installation, preventative maintenance, calibration, training, validation & comprehensive contract cover options available.